You forgot your password and want to reset it. Or jump directly to the Password forgotten troubleshoot chapter. 2) Click on the “Forgot password” button. 3) Input your email address in the field. 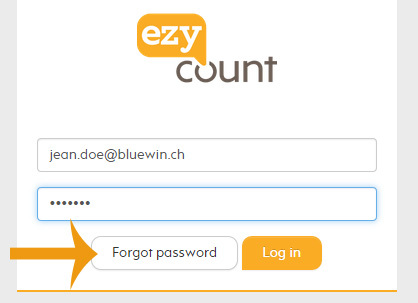 4) An email is sent to you by EZYcount servers. Please click on the link “Change my password” in the email to validate that you want to change your password. The link is active during two hours. 5) Enter your new password and confirm it. You have successfully changed your password. You can now login. I have received multiple validation emails. This is possible if you click several time on the “Submit” button. You can use the link in the last email to change your password. I have a validation email but the link doesn’t work. For security reason, the link is valid for two hours only. Please restart the process and ask for a new validation email.